Ontario, Canada Births, 1869-1913. Courtesy of Ancestry.com. My 6th week in Amy Johnson Crow’s “52 Ancestors in 52 Weeks” family history blogging challenge. 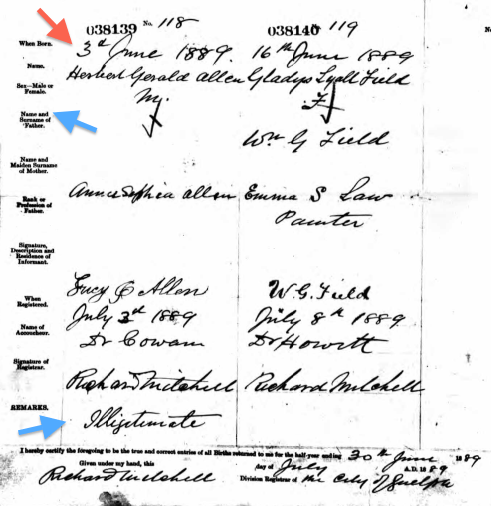 This week’s ancestor relation is my great grand uncle, Herbert Gerald ALLEN (1889 – ? ), born in Guelph, Wellington County, Ontario, Canada. Herbert first landed on my radar back in 2012, when I came across the Ontario, Canada Births, 1869-1913 database on Ancestry while searching for information about his mother Anna Sophia ALLEN (1871 – ? ), my 2nd great grandmother (called “Mamie Grandma” by my mother and her siblings). But since I had never heard his name before, I ignored the record as a possible mistake. I have only ever heard of Mamie Grandma’s two other children Agnes Viola Elizabeth Maud MARA (aka “Viola”, 1893 – 1971), my great grandmother, and Viola’s younger brother William James MARA (1894 – 1952). While reviewing past found documents a few weeks ago in preparation for my trip these past 8 days to the Family History Library in conjunction with RootsTech, I pulled up this Ontario, Canada Births record again for further review. The record clearly lists my 2nd great grandmother Anna Sophia as the mother (at 3 months shy of her 18th birthday) and lists her mother as the informant. But no father is listed, and the baby is branded as illegitimate on the record. Mamie Grandma had a child out of wedlock as a teenager, and either did not know the name of the father or just would not list the name of the father. I asked my mom about Herbert, and Mom confirmed she had never heard her mother, grandmother, or Mamie Grandma talk about Anna Sophia having another son. Yet her grandmother, Viola, talked often of her younger brother William. To complicate matters further, Herbert shows up on the 1891 Canadian census, at 1 year old, in Guelph, Wellington County, Ontario, Canada. He lives with his birth mother Anna Sophia. But he is listed as the “son” of Anna’s parents William Barnabas Allen (1845 – 1916) and Lucy Jane Allen (1846 – 1931), with William being the head of the household. Was this a mistake on the part of the census taker and the person in the household who talked to the census taker? Or were Anna Sophia’s parents attempting to raise Herbert as their own? Herbert drops off the face of the map (at least, my family history map) after this census. He does not show up on the next census in the household of William and Lucy Jane (his grandparents). His mother Anna Sophia married a year later, gave birth to Viola the year following, and then gave birth to William the year after. She too disappears for a while. So I have no idea what happened to Herbert. Since Viola never talked about him, to her descendants, either a) she never knew her older brother Herbert, or b) she knew but did not have a relationship with him and was ashamed of his illegitimate status. So, was he put up in an orphanage? 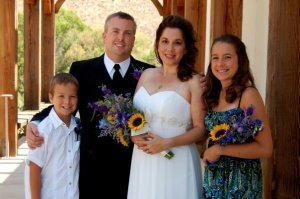 Adopted out? Did he continue to live with his mother and younger siblings? Regardless of what happened to Herbert, it had to be very difficult to grow up in the late 1800s and early 1900s under the label of “illegitimate”, and it had to be even more difficult for his mother Anna Sophia to go through a teenage pregnancy at this period in history. 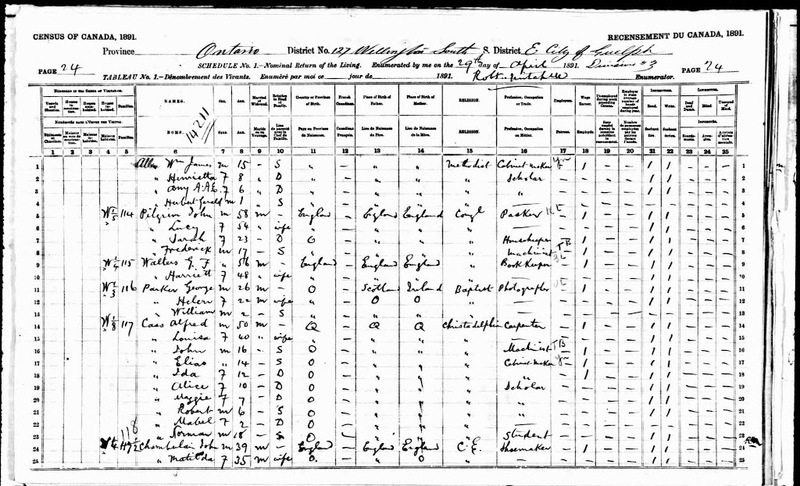 Allen family on the 1891 Canadian Census. Courtesy of Ancestry.com. Wouldn’t one of the possibilities for Herbert be that he died? Have you looked for a death record? I have been researching my ancestors from Scotland who lived in the mid-1800s. There were a lot of illegitimate children. So I googled; turns out it was no big deal at the time and quite common. Yes, that is indeed a possibility. I have looked, no luck yet. But will keep looking. I’d say that throughout all of history there were a lot of illegitimate children! 🙂 This story though was not passed down to his sister Viola’s children. I have a feeling that unwed mothers were more common than people like to admit. I have several ancestors who had children out of wedlock, most lived in the mountains of Virginia and West Virginia. My mom was kind of horrified since it was her family, but I don’t judge. I just wish they had passed down the names of their children’s fathers! I have no doubt unwed mothers were common. This sibling was not made known to my grandmother (her uncle), sadly. I don’t know if my grandmother (the sister) knew. But yes, I agree…the father’s name and history is a total loss since it’s not listed on the birth certificate…unless Herbert somehow tracked him down later.